Also love the earrings you made, they're so pretty! Beautiful mani and earrings are gorgeous as well! Wow! 95th birthaday!! Happy birthday to her :-) The manicure is really pretty! Gorgeous manicure! :D I love this design. Where did you get this plate from? I've never heard of it before. Anutka this nail art is totally amazing! 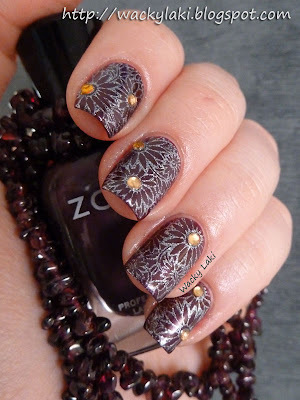 I love the gems and the stamping and I didn't know that Zoya you used for a base and it's gorgeous! Such a great job! Absolutely gorgeous, and those earrings are beautiful! Happy birthday to your grandmother!